East Frisia, ever heard of it? You will find it in the North West of Lower Saxony. East Frisians are well known for their liking to celebrate – and generally you don’t need many ingredients for a good party in this part of the country. There’s a rough draft which has worked best during the last decades on occasions like Town Parties or Fests, Tag der Niedersachsen(every year another town in Lower Saxony celebrates this cultural event on several “days of the Lower Saxonians”), Landestrachtenfest (Federal State folk dance festivals in traditional costumes, also every year in a different town). Take a stage, two beer stands nearby, a sausage (Bratwurst) grill, and the Bisch Basch Band. The result: lots of fun, jokes & nonsense, dancing – and people who are getting to know each other. Why that is so can hardly be put in words. The ambiance you’ll find there is unique even in Lower Saxony – and Bisch Basch Band is in any case one thing: unique and different from all other bands. You’d notice it from a distance. These East Frisian veterans do not meet the standard array you’ll find with usual Cover Bands. It starts with their yellow colored Bisch Basch. Only consisting of a wooden box, a used plastic oil jerrycan and a cymbal fastened one on the other, this selfmade percussion instrument can bee seen from afar. Hans-Georg Scholmann is playing this fancy instrument, hammering on it all night with his mallet as if he’s never done anything else in his life, adding this distinctive sound to Bisch Basch music. No other band has this notorious “plump-klack” noise. Next to the Bisch Basch is Foline Scholmann’s place, who is sitting behind her old time washboard and rather small drum kit, armed with two drumsticks. Who, as a kid, has played with his mother’s pots, can easily imagine that a washboard, too, makes noises when you beat on it. What it sounds like is best listened to live. The “singing nightingale” from East-Victorbur(not to be confounded with West-Victorbur!) is the female voice in the music of the Bisch Basch Band. On Foline’s right stands Wiard Bomgaaren with his red grumbling bass guitar. The “singing quintal” and so called band’s beau from Norden, makes any woman’s heart beat faster or melts it with his agreeable, warm voice when he sings Irisch Folksongs. After all, thanks to his body as a resonator, he is a fantastic background choir or second voice. 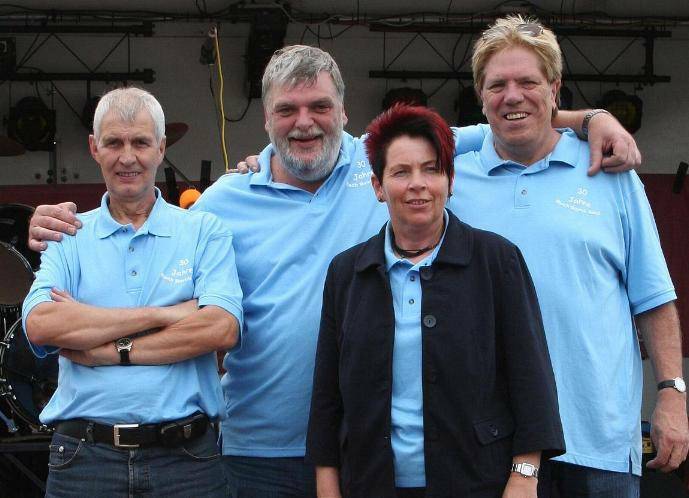 What started some 30 years ago as a Comedy-Music-Group à la Insterburg&Co, evolved into a band playing all kinds of music with lots of humor: re-arranged, well known pieces of all styles as well as their own compositions (often in East Frisian language). Those who party with “Stampfkartoffeln” (Potato Mash) and listen to the heroic epic of East Frisians “Harm Jansen and Gerd Gerdes” will have something to tell the next morning. Not for nothing the slogan of the band is: jerrycan, good vibes, Stampfkartoffeln. With this in mind: let’s meet in the front row.